Antonio Machín (1903-1977) was born in Sagua la Grande on the north side of Cuba, and was an important figure in early Cuban recording, particularly in the 1930s, when he released loads of wonderful 78s. He had numerous bands (Cuarteto Machín, Sexteto Machín, and the septet featured here), and eventually moved to Europe. This was recorded in New York on October 31, 1935, just before Machín had relocated. One of the interesting things about this release is that it’s on HMV’s “GV” series of Latin American, Caribbean, and South American music, which was started in 1933. The “GV” series was exported to, and marketed specifically for, the diverse population of West Africa. The music on the series was a major influence on the development of Afro-Cuban music througout the continent, as the records reached far beyond the West. The rhumba movement in the Congo has been directly linked to the dissemination of the “GV” series, for instance. But even without its history, it’s fine music nontheless. The title of the track translates to “The Party,” although the lyrics seem quite sorrowful (perhaps someone could save me from some embarrassing translations here). It is a guajira son, which is a guajira sung in the rhythm of a son, a style that was first made famous in the late 1920s. 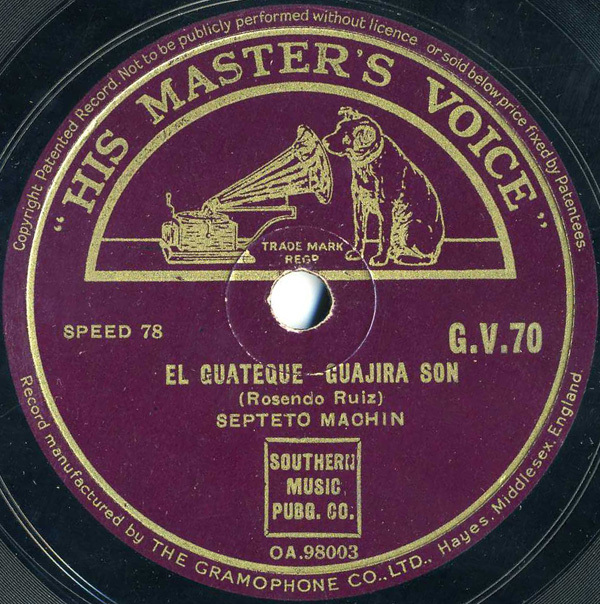 There are several fine collections of early Cuban music on the market, including several that feature Machin.